Austin, Texas is located in the heart of Mexican free-tailed bats’ summer range. Indeed, the world’s largest Mexican free-tailed roost, estimated to contain over 20 million bats, is less than sixty miles away, in Bracken Cave. The largest urban free-tailed colony is located here in the capital city, beneath the Congress Avenue Bridge. Like most large summer colonies, the roosts are nurseries, inhabited by females and their young. Male bats and females who do not conceive establish smaller summer roosts under lesser bridges and in rock crevices, caves, abandoned mines, tree hollows and buildings. Austinites love their city’s flying mammalian residents. When asked about tourist sites, they often recommend a visit to the Congress Avenue Bridge at dusk, when the bats emerge for their nightly forays, swirling in long columns to evade the hawks and owls hovering nearby. Austin residents, however, have not always been so friendly towards the bats . Named after their tail, which protrudes beyond their tail membrane, free-tailed bats are found on every continent except Antarctica. Mexican free-tailed bats are indigenous to the Americas. They range from the southern half of the continental United States, through Mexico and Central America, to parts of South America and the Caribbean. Each population has its own migratory route, which it follows year after year to the same wintering and summering spots. The largest population of Mexican free-tails, estimated at over 100 million, winters in northern and central Mexico and summers in central Texas. They roost in the regions’ many limestone caves, forming colonies that number in the millions. Free-tailed bats have resided in Austin since the city’s founding in 1839. They roosted between attic rafters and behind the loose wall boarding of houses, churches, university buildings and even the capital’s first city hall, which residents nicknamed “the rookery”. Settlers brought with them religious superstitions about bats and treated the animals as pests. In the 1930s and 40s, after construction of dams along the Colorado River flooded their caves, female bats established nursery colonies in football stadiums, including the Texas Memorial Stadium at the University of Texas in Austin. The University responded by sealing cracks in the overhanging seating decks, and it contracted exterminators to spray the stands with cyanide gas. 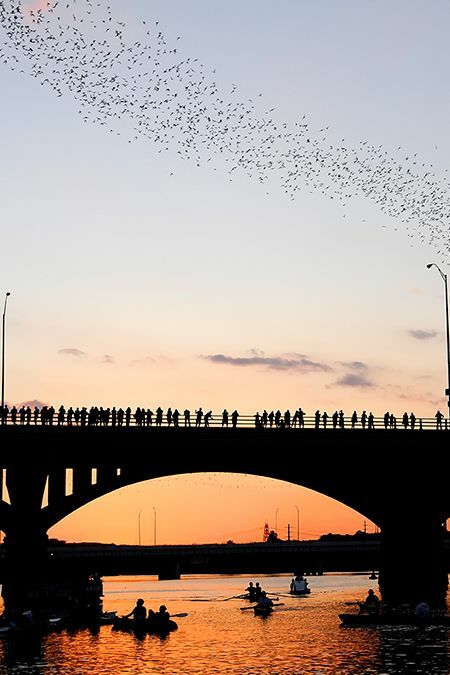 Austin’s bat population remained in this way checked until 1980, when the city completed renovations of the Congress Avenue Bridge. In addition to enlarging the bridge’s piers and widening its deck, workers replaced the substructure with steel beams, creating long, narrow crevices whose temperature and humidity levels were ideal for free-tailed pups. That spring, female bats established a nursery beneath the bridge. The colony grew each year by the hundreds of thousands, and by 1984, its population had peaked at 750,000 adults, making it the largest urban bat colony in the world. Local newspapers published sensationalist articles about rabid bats. Alarmed, Austinites petitioned the city to eradicate the roost. City officials declared a public health crisis and proposed to plug the bridge’s crevices with wire screens, hardware cloth or rubber. By the mid-1980s, news of the capital’s bat problem had reached Bat Conservation International. In an effort to save the nursery, the organization relocated its headquarters from Milwaukee to Austin and launched an educational campaign, informing Austinites that bats curb mosquito populations and seldom carry rabies. The organization also shared a piece of information that was of particular relevance to food gardeners: during the summer months, a third or more of free-tailed bats’ diet comes from moths, including North America’s number-one agricultural pest, the earworm moth, known for decimating corn and tomato crops and devouring a wide range of vegetables and fruit, including artichoke, asparagus, cabbage, cantaloupe, collards, cowpeas, cucumbers, eggplant, lettuce, lima bean, melon, okra, pea, pepper, potato, pumpkin, snap bean, spinach, squash, sweet potato, and watermelon, grapes, peaches, plums and strawberries. These educational efforts affected a turn-around in public sentiment, and in 1989, residents halted plans to illuminate the bridge with lights that would have disturbed the colony. Today, Austin’s bat nursery is a local treasure and a popular tourist attraction. In addition, increasing numbers of Austinites are encouraging bats to summer in Austin by constructing bat houses, where male bats can form small colonies. Bat tenants return the favor by eating huge amounts of insects as well as food garden pests. If you are a food gardener and would like to reduce your pest population by encouraging bats to settle nearby, you can find a plethora of online resources about building and installing bat houses on Bats Conservation International’s website. Bat Conservation International can also help by recommending certified bat houses. The process is easy, and your plants will thank you!